Time for a hot shower! Stationary hot water high-pressure cleaners from Kärcher blow away even the toughest dirt easily. They use a burner with an ebm-papst gas blower to heat the water. When talking about Kärcher high-pressure cleaners, many people think about the compact yellow household helpers that spotlessly clean patios, façades or garden furniture. But Kärcher also offers a wide range of products for professional applications, including stationary hot water high-pressure cleaners. They are used wherever lots of cleaning needs to be done often, for example on large farms, in the food processing industry, or the automotive industry. They work much differently than the units used in private households. Pressure and hot water are centrally produced by stationary systems and supplied via piping to various dispensing points where the users attach high-pressure hoses and attachments before cleaning. 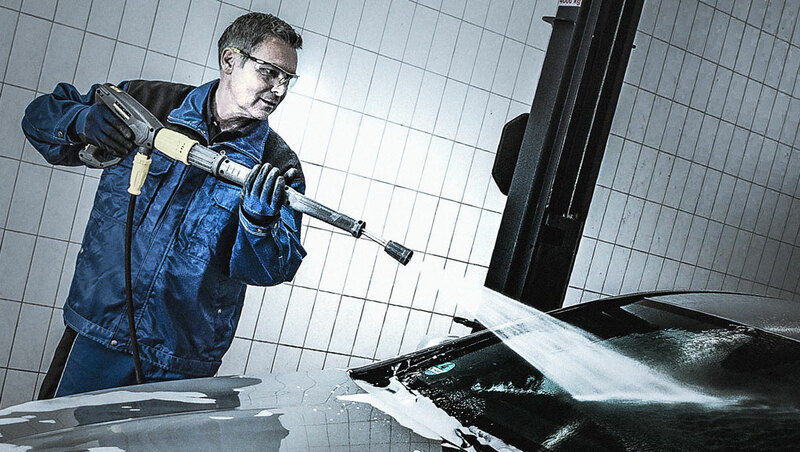 The hot water enables fast and thorough cleaning without any chemical aids,” says Steffen Burger, Product Manager for stationary high-pressure cleaners at Kärcher. “Ideal cleaning results vary from case to case depending on the pressure and the amount of water used.” At a maximum pressure of 140 bar, the hot water high-pressure cleaner uses up to 1,200 liters per hour, heating the water up to about 80 degrees Celsius. However, very good results can often be achieved at only 60 degrees. Then the user saves energy without having to accept lower quality. There are two basic designs for the hot water high-­pressure cleaner; one heats with oil and the other with gas. Though the oil version is more common, the gas version is better suited for facilities with especially high cleaning volumes. “Of course another requirement is a gas connection on site,” says Burger. “When that is available, the gas version is more economical in the long run because gas is the cheaper energy source.” Kärcher produces the components for oil combustion completely on its own, but it cooperated with ebm-papst on the blower for the gas version.